President Donald Trump's immigration ban from seven Muslim majority countries causes outrage over the country. Roars of applause following Sen. Elizabeth Warren’s call that “We are not alone” and chants from the crowd screaming “No hate, no fear, refugees are welcome here” echoed off of the buildings surrounding Copley Square on Sunday, Jan. 29. Thousands gathered at a last minute-protest in response to an executive order that banned refugees and other visitors or immigrants from entry to the United States from seven predominantly Muslim countries — Iran, Iraq, Libya, Somalia, Sudan, Syria and Yemen. Signs with slogans such as: “Build kindness, not walls,” “Immigrants and refugees are welcome here” and “White silence is White consent” were held high against the Boston skyline. There were students and teachers from the high school at the recent Women’s March on Washington in Boston as well as at this more spontaneous protest. Junior Sebastian Wood attended both protests and said that he will continue to stand for what he believes is right. “We have to protest to show that this is not okay and this is not normal,” Wood said. Spanish teacher Pedro Mendez also attended the afternoon protest, chanting with others on the steps of the Boston Public Library. Mendez said that he, who was born in Mexico, has had to face impositions by the government. “I have had to suffer consequences of the government, so I am here to support” others, Mendez said. 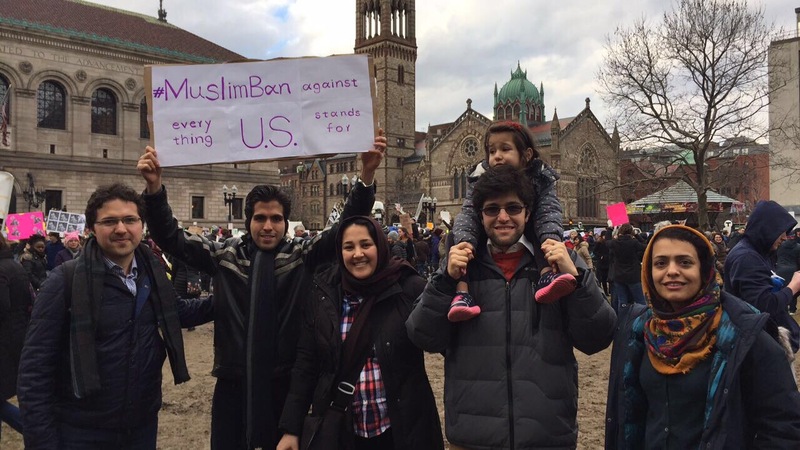 Mohammad, a 31 year old Iranian immigrant, is a postdoctoral fellow at Harvard University researching cancer. He chose not to give his last name because he said he is uncertain about the future and his family in Iran. He found out about the protest the night before and attended with a group of family and friends. “I am originally from Iran and many of my friends and family live there. I visited just two weeks ago and now if you are living here and you want to leave, you might not be able to come back,” Mohammad said. Wood said that Trump’s executive order is wrong and that he will continue to voice his beliefs about future injustices. “It’s a horrible thing, and I am going to continue coming to all of the marches,” said Wood.